Where possible, we offer solutions to the practical problems, calling attention to policy issues that require further consideration or research. The ACA was designed to cover Americans through a Medicaid expansion for federal subsidies. The Medicaid expansion applies to adults earning up to 138 percent of the federal poverty level (FPL), while federal subsidies are designed to help individuals earning up to 400 percent of the FPL purchase private insurance through a Marketplace. However, the Supreme Court’s 2012 ruling allows states to opt in or out of the law’s Medicaid expansion, causing unintended consequences for the ACA’s other provisions. 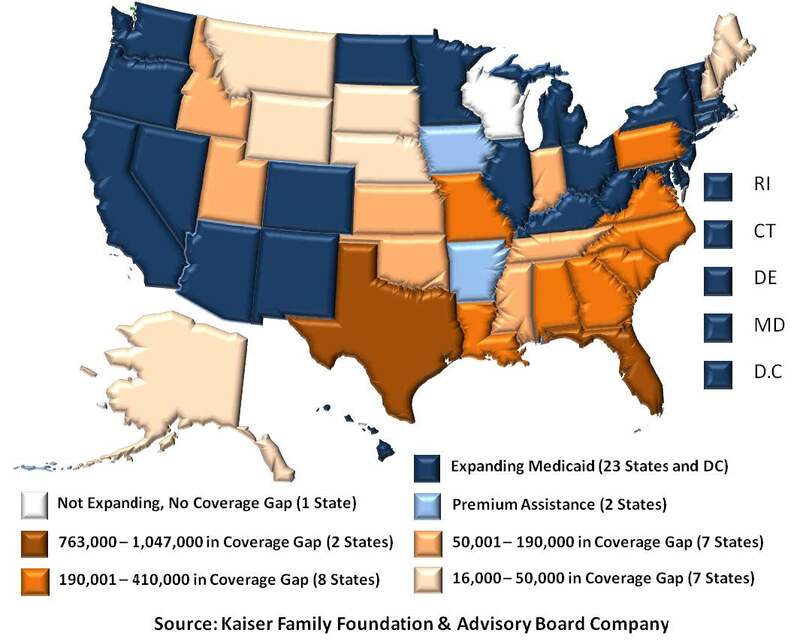 As of January 2014, only 25 states and the District of Columbia have elected to expand Medicaid under the ACA.1 Since the ACA can only provide subsidies for individuals earning over 100 percent of the FPL ($23,550 for a family of four), a coverage gap has formed in non-expansion states— leaving many of the neediest Americans ineligible (See Figure 1). As a result, in states that do not expand Medicaid, residents earning less than 100 percent of the FPL are not covered by the ACA because they are ineligible for both Medicaid and federal insurance subsidies. An estimated 4.8 million uninsured residents in 25 non-participating states currently earn less than 100 percent of the FPL but are ineligible for Medicaid coverage or Marketplace subsidies (See Figure 1). The individuals in this coverage gap—some of the poorest in their states—form a “hidden population” that will not reap the benefits of the ACA and likely will be unable to access affordable healthcare. Under the law, the federal government cannot provide subsidies to these individuals, even if their states opt out of Medicaid. This hidden population poses a public policy issue that affects the entire health community. Behavioral health providers must mitigate the problem as best they can, while federal and state policymakers pursue long-term solutions. Some information about this population exists, but available data are insufficient, and no data is available on this population's behavioral health, particularly their substance abuse treatment needs. While research may be required for advanced planning, providers in non-expansion states can safely assume that many potential clients will fall into this coverage gap. If this gap is not closed, the behavioral health field will need targeted research to better understand and better serve this hidden population. Unlike the coverage gap, which ultimately requires a policy solution beyond the capacity of individual providers, substance abuse providers also face more specific, operational challenges that can be overcome through targeted education, training, and strategic planning. Chief among these is providers’ internal knowledge gap—an insufficient understanding of the ACA, which makes it difficult for them to craft strategic plans for the new financing environment. One survey found that 83.7 percent of health insurers want to increase their company’s internal understanding of the ACA while another found that most physicians were “not at all familiar” with major provisions. The ACA offers tremendous opportunities for substance abuse providers to help needy Americans by capitalizing on new funding streams and newly-eligible clients. But before providers can seize these opportunities, they must ensure that they have a sufficient understanding of the law to craft a strategic approach. First and foremost, leaders must honestly assess their own ACA knowledge level to determine whether additional education, training, or other outside technical assistance is required. Provider leadership must take an active role in shaping organizational direction for the agency, as the healthcare environment will continue to evolve for the foreseeable future. Now more than ever, substance abuse providers are at a crossroads that will shape their success or failure and those who take an active approach to education, training, and strategic planning are more likely to succeed. Numerous educational resources are available through the U.S. Department of Health and Human Services (HHS), state agencies, and non-governmental organizations. In addition, consultants can play a vital role in education and strategic planning, which can pay dividends as providers chart a strategic course through confusing financial times. Of course, education and training are not limited to leadership, and providers should ensure that their staff has a working knowledge of the ACA that is sufficient to implement the organization’s strategic plan. A staff survey can provide a useful baseline and allow provider leadership to target educational and training resources where they will do the most good. Using a mix of in-office meetings, training events, educational materials, and informal conversations, providers can ensure that both their frontline and management staff have the knowledge they need to best serve their clients and their organization. Targeted staff education will be crucial to providers’ success because it will help mitigate another key challenge: clients and prospective clients who are unaware of their new coverage options. According to a Kaiser Family Foundation (KFF) tracking poll, 44 percent of Americans, and 55 percent of uninsured Americans, are not sure how the ACA will affect them. These knowledge gaps may be even more significant in the substance abusing population. Before providers can help clients with unmet needs, they must ensure that eligible individuals are enrolled in coverage. Because education, outreach, and enrollment are part of the ACA’s broader coverage expansion, providers have the option to conduct independent outreach efforts or partner with Marketplace navigators, advocacy groups, Single State Agencies, or other government entities. Many Medicaid expansion states have focused outreach efforts on their Marketplaces, relying on HHS and NGOs for Medicaid efforts. While education and outreach funding is significant in highly engaged states, numerous community organizations have reported insufficient funding for their ACA outreach programs—presenting a clear role for behavioral health providers. By expanding or developing education, outreach, and enrollment programs, behavioral health providers supply a valuable community service while advancing their own business goals. The unprecedented opportunities afforded under the ACA bring with them a host of new challenges that behavioral health providers must confront as they attempt to chart successful course through a post-ACA world. Although the precise impact of the ACA remains to be seen, providers will surely encounter opportunities to reach new clients and access new revenue. Providers can only mitigate problems like the coverage gap’s hidden population, while researchers and policymakers pursue long-term solutions. However, the immediate challenges facing providers can be overcome at the organizational level. Insufficient knowledge of the ACA—and an inability to capitalize on that knowledge—is the single largest barrier for providers and clients alike. Through targeted education, training, outreach, and strategic planning, behavioral health providers can assure that they and their clients are ready to maximize the benefits of the changing financial landscape. 1. The 25 expansion states include states with premium assistance waivers. If HHS approves Pennsylvania’s waiver, it would be the 26th expansion state.